303 x 236 mm. – 210 leaves. With 1 large and 77 column-wide miniatures, 80 decorated initials with coloured foliage on burnished gold grounds and border decoration. The collection of seemingly disparate texts was not randomly selected. It begins with the preface and Genesis from Guiart des Moulin's Bible historiale, a French adaptation of Peter Comestor's Historia scholastica, summarising the narrative sections of the Bible. Among other texts the lives of the saints were given in verse and in prose and the narrative closes with the story of the loyal and incomprehensibly patient Griselda. This compilation fits into an approach that employs religious matter in order to both entertain the secular reader and encourage good conduct. Such anthologies were addressed as edification to the young nobility. Elegantly written in a lettre bâtarde throughout, the large format book presumably may have been made for reading aloud during a meal or a festive evening, or for teaching noble youngsters during their private lessons. Those who were captivated could have a glance at the illuminated pictures, when the book was open on a lectern in the library. The rich illustration is created in the workshop of the Master of the Berry Apocalypse, named after his major work for the Duke of Berry (New York, PML, M. 133). 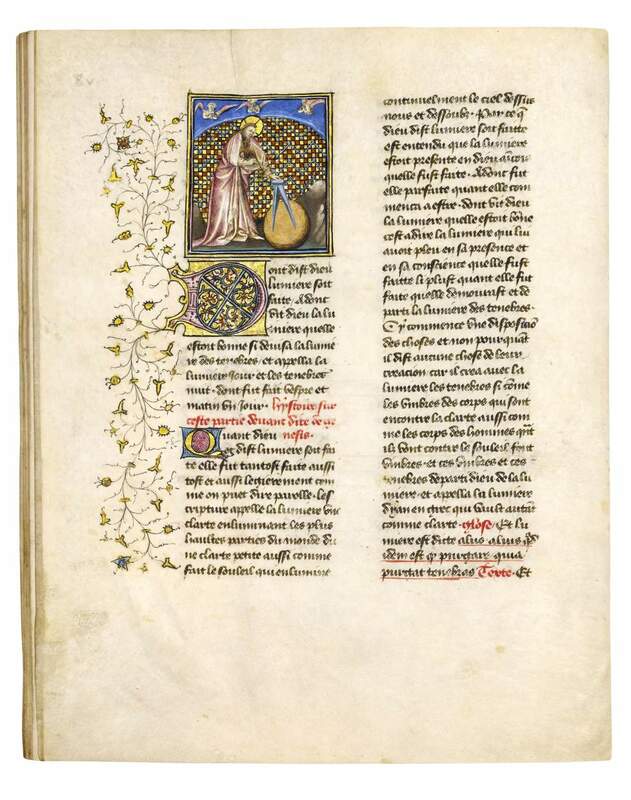 Active c. 1407-1420, our Parisian master seems to have specialised in manuscripts with large illustration cycles. He distinguished himself by his graphic approach with sparing application of colour, giving the impression of coloured grisaille, in which he differs from his contemporaries. As the miniatures focus on figures and narration, the results are very lively and engaging compositions.